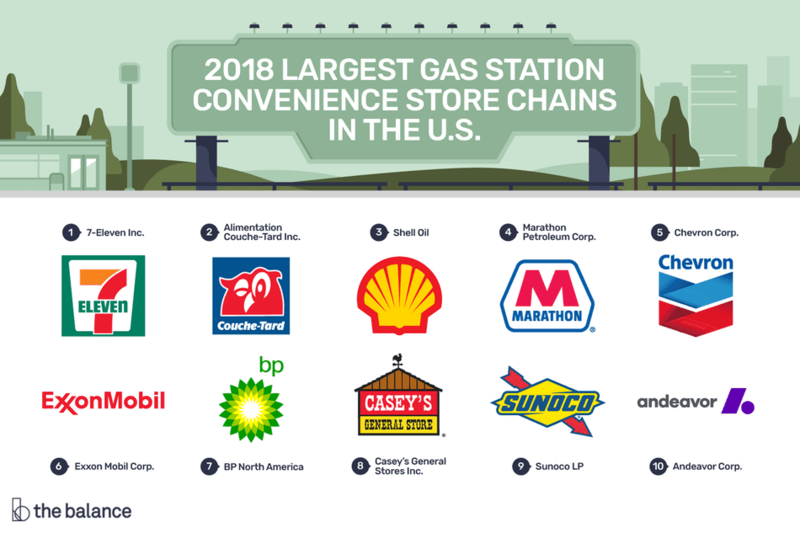 Largest Gas Station Convenience Store Chains in the U.S. The U.S. convenience store industry continues to grow with 154,958 stores and combined sales of $616.3 billion in annual revenue for 2017. Growth was slower for convenience store chains than in previous years, however, with a 9 percent revenue increase that was driven largely by a 12.4 percent increase in gas prices, according to Convenience Store News. The convenience store segment of the U.S. retail industry is a segment worth watching and measuring. There are many ways to measure and rank the “largest” convenience store chains operating in the United States. The way Convenience Store News chooses to measure and rank each year is according to the total U.S. store count, whether the parent company is based in the United States or in another country. The study reveals that the top ten largest convenience store chains operating in the United States include 7-Eleven, BP, Shell, Chevron, and Alimentation Couche-Tard. These stores do not change their rankings much from year to year, however, there are exceptions, such as Andeavor Corp., which jumped 26 ranking positions to 10, and Valero, which didn’t make the top 100 list in 2017 but ranked 15 in 2018. Convenience stores offer many benefits to travelers stopping for gas or to buy something to eat. Their long hours of operation, convenient locations, and popular food items attract and serve large numbers of customers daily.